Looking for Rhubarb Companion Gardening ideas? My experience with growing rhubarb is that it grows very well alongside almost any garden vegetables and flowers, but there are a few points to consider in this regard. Here are a tips suggesting a few plants that should not be planted near rhubarb, and several suggestions of plants that are favourable/helpful to grow alongside rhubarb in the home garden. Gardening with Plant Companions is a great concept, by which, with careful planning, you can "help plants help each other" by choosing which garden companions to grow together. In some cases this method of planting can help attract "helpful" bugs or repel "harmful" bugs. In other instances particular types of plants may be planted to assist other plants by the natural addition of nutrients into the soil. There are claims that companion planting helps to improve plant growth, plant health, and food flavour. Even planting certain larger leaf plants, (for example, rhubarb), can assist other, more sun sensitive plants by providing shelter from the sun. Members of the Brassica family such as broccoli, kale, cabbage and cauliflower are also good companions for rhubarb, but rhubarb really does not require specific garden companions. In fact, our rhubarb garden is just that...a rhubarb garden, with no other vegetables or other plants, and it thrives amazingly! One visitor to Rhubarb Central.com offers this advice: "Whilst rhubarb doesn't really need companion plants, strawberries are in fact a fantastic companion plant for rhubarb and the relationship is very much reciprocal." Thanks for the tip Taya! Some gardeners claim that rhubarb should not be planted near legumes, because legumes may attract the tarnished plant bug, which can become a rhubarb pest. 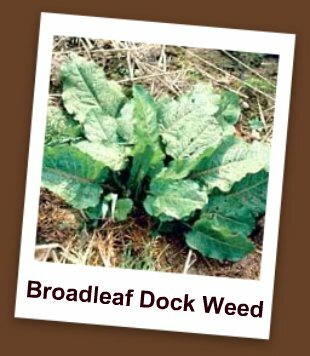 One weed, which does adversely affect rhubarb is Dock Weed Plants. 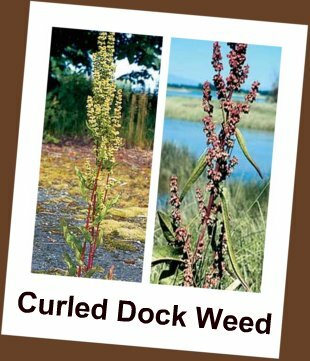 Dock Weeds, (see the pictures below), are perennial weeds and a member of the Buckwheat Family growing 0.8 to 1.5 metres tall. These weeds have a deep penetrating yellow taproot; dark green leaves that are wavy and crisp along the margins. Dock Weeds turn a rusty-red colour when mature. 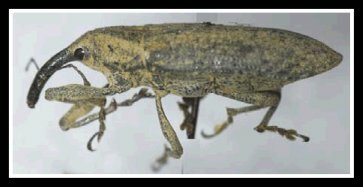 These weeds attract a bug called the "Rhubarb Curculio", a yellowish beetle that bores into rhubarb stalks. Some sources claim that rhubarb plants protect beans, peas, and other legumes against the black fly, and deters spider mites from columbine flowers. I personally have not had the opportunity to test these theories. Below are helpful books with information about Companion Gardening which can be purchased online at *Amazon.com. Click on the images below for additional product information and customer product reviews. ★ If you have experience with rhubarb garden companions, please let me know via the contact me form, so that I can inform other readers of your experiences. Thanks! 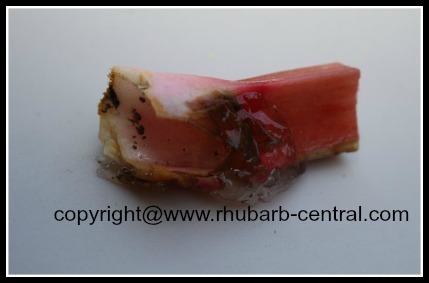 Below are links to pages within this site (or use the navigation bars) with helpful information for all you need to know about growing rhubarb in the home garden! ONTAINER GARDENING - Can Rhubarb be Grown in Containers/Pots?